Madder is a low creeping plant that will cover an area of ground quite quickly. It does not need a great deal of looking after apart from the occasional weeding. The plant matures at 5 years old. The flowers are small and yellow/green in colour. The berries are dark when ripe and can be used as seed stock to multiply the crop. 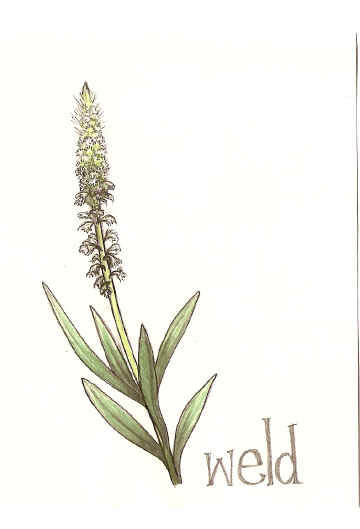 The part of the plant used for the dye is the tuber type roots. The plant should be pulled from the ground after loosening the soil. The leaves can then be stripped off the plant and the roots put in a sheltered place to dry out. When dry the roots can be ground up into a powder. Alum gives a deep red on wool. Copper will brighten the colour. Ratio (by weight) of fresh to powder is 3:1. Use 100g material and 4l water for a strong dyebath. Likes hard water so add some chalk. The max temp is 158f or 60 c. But 140 is better for brighter reds. Also known as 'dyers rocket' because of the speed and height that it grows to. The seed is very small and fine and should be planted in rows a foot apart. It grows at an amazing speed up to the height of 6 foot plus. The head of the plant flowers with small yellow clusters which set to seed pods. Easily grown in any well-drained neutral to slightly alkaline soil in a sunny position or in some shade if the summers are long and hot. At one time this plant was commonly cultivated for the dye obtained from the leaves and seed but with the advent of chemical dyes it has fallen into disuse. A good plant for bees and butterflies. Plants dislike root disturbance, they can be transplanted but care must be taken not to break the tap root. Seed - sow in situ in the spring and only just cover the seed. An autumn sowing usually succeeds in areas where winter temperatures do not fall below about -10°c. The seed germinates in the autumn in the wild. In the first year it looks like a dandelion! This is what it looks like in the early summer of year 2. 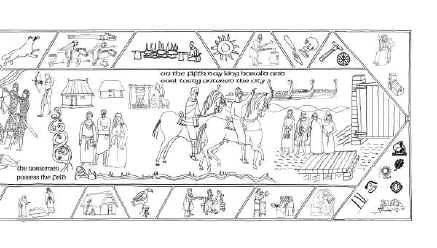 Woad seed can be sown in the garden to provide leaves for dyeing in the first year and to flower as an attractive garden flower in the second. The seed can be sown about 5 cms deep in March or April. The seedlings can also be transplanted. Keep it clean weeded. By the end of June the leaves will be full size for the first year, about 20 cms tall. 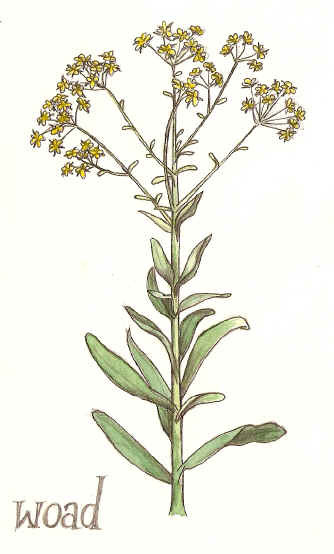 In the second year the Woad grows to about 1.5 metres with masses of small yellow flowers. Use first year leaves from July (best) until November. 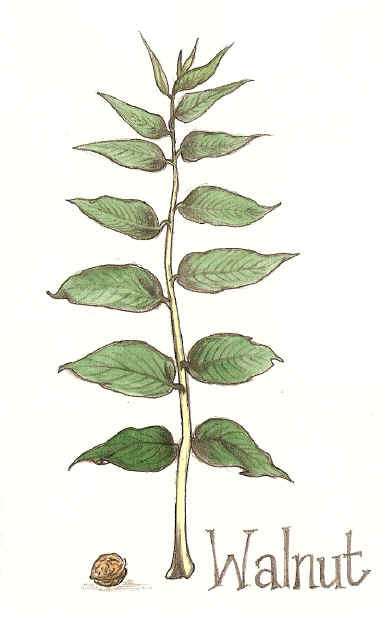 It is also possible to use the small leaves which occur in the second year. Drop the leaves into fast boiling water with a pinch of cream of tartar. Boil for 2 to 3 minutes. Remove the leaves and cool the liquid as quickly as possible. Add ammonia until the Liquid is yellowish in colour. Bring the liquid to 60 degrees Centigrade while adding ammonia until yellow again. Add sodium dithionite to de-oxidise the liquid. Stir gently without splashing until a bronze scum appears. Put in the hot wet wool then remove it and shake in the air. Dip it again if not blue enough. It is a fast dye that fades little in sunlight or in washing. 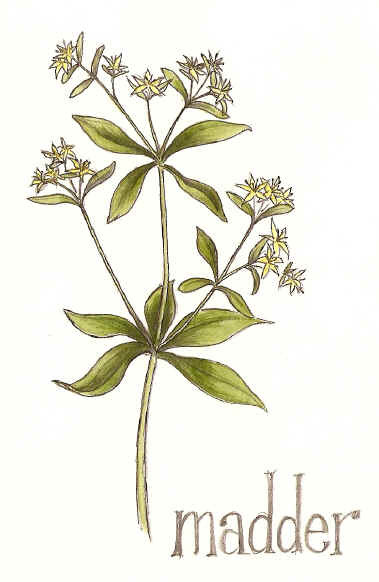 Pick in the hedgerows in early summer when the plant has flowered. It is so plentiful that there are no known restrictions on its harvest but always worth checking. 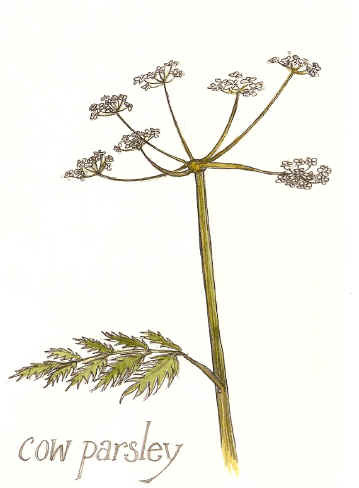 BUT it comes from the same family as hogweed and hemlock (as well as carrots) so take care if you are not familiar. Chop the plants and bring to the boil and simmer for about an hour before straining. The wool you use must be mordanted (alum works well) and simmer for an hour. The result is a green-yellow. This is a superb resource and a harvest will do no harm to a healthy tree. The young leaves make a reddy-brown, mature leaves a darker, but warm brown, and the nuts (husk and all) give a black-brown. Boil the walnut plants for an hour and use the liquid by simmering for up to an hour. The wool will look darker in the dyebath than once it is washed, so leave it a bit longer than the colour you require to pick up the hue you desire. Although this is known as the native Walnut, the name is though to come from the old English word wealhhnutu, meaning literally 'foreign nut'. (This has the same root as Welsh - meaning Foreigners).